Neither Man Nor Wolf Trailer: Mowgli: Legend of the Jungle! Andy Serkis takes Rudyard Kipling’s Jungle Book and reimagines it for film in Mowgli: Legend of the Jungle – as young Mowgli is torn between the world of the jungle, where he was raised, and the world of man. Mowgli: Legend of the Jungle will premiere on Netflix and in select theaters on December 7th. How We Got There Trailer: War for the Planet of the Apes! Refresh your memory – War for the Planet of the Apes: Legacy recaps the story so far. War for the Planet of the Apes opens on July 14th. War for the Planet of the Apes – Watch Andy Serkis Become Caesar! War for the Planet of the Apes – Caesar (Andy Serkis) – Photo courtesy of 20th Century Fox. With only a few weeks left until the premiere of War for the Planet of the Apes, 20th Century Fox has released a stunning video of Andy Serkis becoming Caesar – a video that shows he is not just voicing a CGI character, but acting the role in the truest sense. She is the Future Trailer: War for the Planet of the Apes: Meet Nova! In every trailer for War for the Planet of the Apes, there are glimpses of a little blonde girl who travels with Caesar’s arny of apes. This new trailer introduces us to Nova – how she got her name; how she came to be traveling with the apes. If apes and humans are to not wipe each other out, she might just be reason. Apes Together Strong Trailer: War for the Planet of the Apes! The trailer for War for the Planet of the Apes has dropped and it looks very good. The trailer introduces a new character – a small ape who has already done his share of surviving. We also see Cornelius helping a little human girl, and meet the film’s off-his-nut human military leader – referred to only as Colonel (Woody Harrelson). Andy Serkis, of course, returns as Caesar – and he’s got a bone to pick with Colonel. Directed by Matt Reeves, War for the Planet of the Apes premieres on July 14th. Last Stand Trailer: War for the Planet of the Apes! It’s on! Humanity screws up Big Time. The first trailer for War for the Planet of the Apes follows the break. It opens on July 14, 2017. NYCC 2016: War for the Planet of the Apes Digital Billboard Unveiled! A digital Billboard for War of the Planet of the Apes was unveiled today at New York Comic-Con 2016. 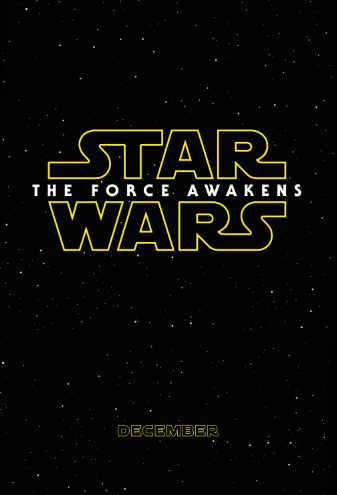 Family Force Teaser: Star Wars: The Force Awakens! There’s something awfully familiar about this teaser – something that tickles the back of my mind; something that feels just so correct. Between moments of nostalgic wistfulness and current action – and the appearance of a couple of old friends – the new teaser for Star Wars The Force Awakens is a perfect balance of everything we loved about the original trilogy. Check it out after the jump. That’s More Like It Trailer: Star Wars: The Force Awakens! John Boyega in a Stromtrooper’s armor? In a desert? An upside-down Millenium Falcon in a dogfight? X-Wing fighters? Oh, yeah! Star Wars is back, baby! Check it out after the jump. 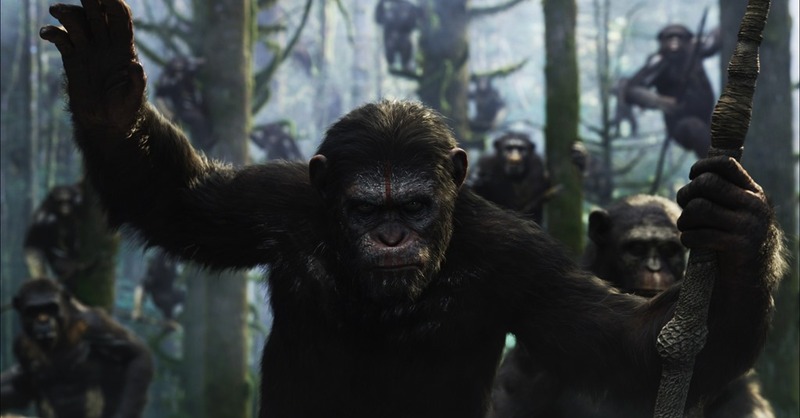 Pivotal Trailer: Dawn of the Planet of the Apes! Dawn of the Planet of the Apes takes place in that moment when it could have been Planet of the Humans and Apes and then goes sideways. The new trailer shows the beginnings of Ape civilization and a devastating revelation. Check it out after the jump. Dawn of the Planet of the Apes invades theaters on July 11th. Trailer of Doom: Dawn of the Planet of the Apes! Dawn of the Planet of the Apes will be in theaters July 11, 2014.